Let’s face it…sometimes you just have to eat right now! no really, like RIGHT NOW! you know what I mean. No time to fuss around in the kitchen. Here’s an easy go-to 10 minute option when you find yourself in that predicament. 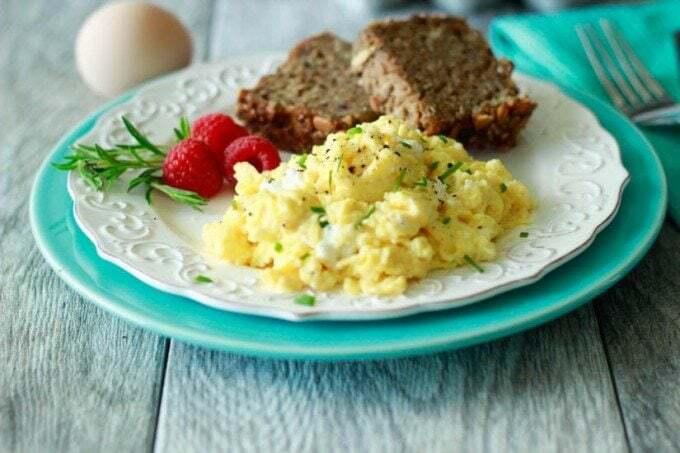 Creamy goat cheese folded into easy to prepare scrambled eggs and a few snippets of fresh chives make this a delicious and quick option. The goat cheese gives the eggs a super creamy texture and together with the chives they create a savory morning treat. Although, you don’t need to save all this goodness just for the morning. They make an excellent brunch, lunch, or dinner option as well. Feeling creative? Add some tomatoes or asparagus. Serve with toasted Artisan bread and some fresh fruit and you’ve got a company worthy meal, that’s simple enough to serve any day of the week. In a medium bowl, whisk eggs, water (or milk- this helps to make the eggs extra fluffy) salt and pepper for 1-2 min. until fully blended together. Spray a medium fry pan with non stick cooking spray heat over medium-high heat. Add eggs, reduce heat to low. Use a spatula or wooden spoon to fold eggs over themselves as they start to set. Just before the eggs have reached desired consistency add goat cheese, continue to heat until cheese has melted and integrated with eggs. Garnish eggs with chopped chives and serve. I’ve added a lot of dairy to my eggs, but I can’t remember adding goat cheese. Must try soon – thanks for the inspiration! Mmmm that looks like just what I need when I get home from work and I haven’t got the energy to do anything! thanks Jo!- yes exactly! 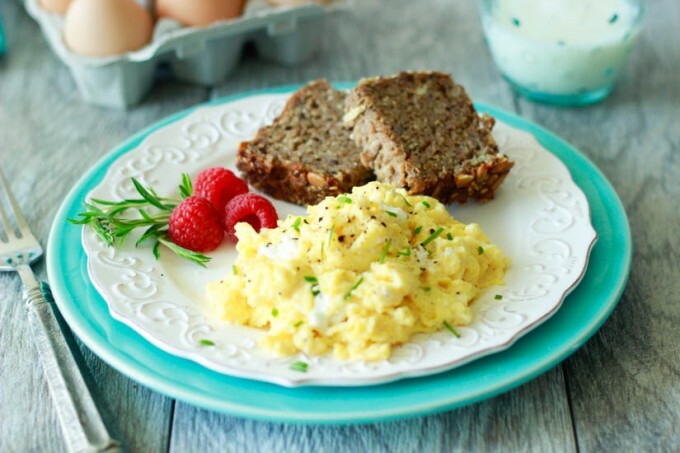 eggs are my go to anytime I’m running short on time and want something easy and delicious. Your photo drew me in! They are beautiful. I eat scrambled eggs at least 3-4 times a week, but I’ve never tried goats cheese in them. I’ll definitely give it a go. Thanks Werona…I hope you enjoy!